Reward your staff and enjoy a well deserved break with this handy and delicious Nestle Break Pack. This convenient pack contains both coffee and chocolate biscuits, which is ideal for meetings and shared kitchens. 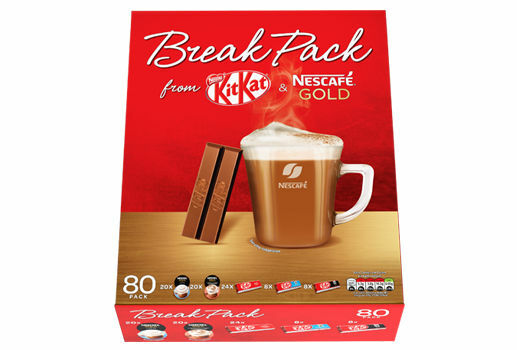 Each 1.5kg pack contains 20 x Nescafe Gold Latte sachets, 20 x Nescafe Gold Cappuccino sachets, 24 x 2 finger milk chocolate KitKats, 8 x 2 finger Cookies and Cream KitKats and 8 x 2 finger dark chocolate Kitkats.